MY TOP 3 FOOD MARKETS IN EAST LONDON | RAWR BOWS. If you follow me on Instagram you’ll know by now I love food - my whole social life revolves around food: brunch, cake, lunch, dinner, drinks, you name it. If there is food, I am there. Living in London makes it so easy to want to try a different cafe every weekend, Instagram is flooded with food accounts about the best places to eat in the city. And you can’t say no to a mouth watering brunch that’s only a tube ride away. I have never been a market kind of girl. I like to sit down at a table and chat with my friends whilst we wait for our food and enjoy the nice decor. Also, London’s weather is not exactly ideal to walk around markets as you never know when it’s going to start raining, hailing or snowing. I quite literally stumbled upon this market a few weeks ago when I was walking around Greenwich - I had no idea there was a market there, let alone one that sold food. I had a Mexican empanada and a delish iced latte for lunch, which I totally recommend. They also had a great selection of desserts, from refreshing watermelon juice to rich and dense brownies. I tried some Jamaican dessert made with coconut (I wish I could remember what it was!) which was so good! 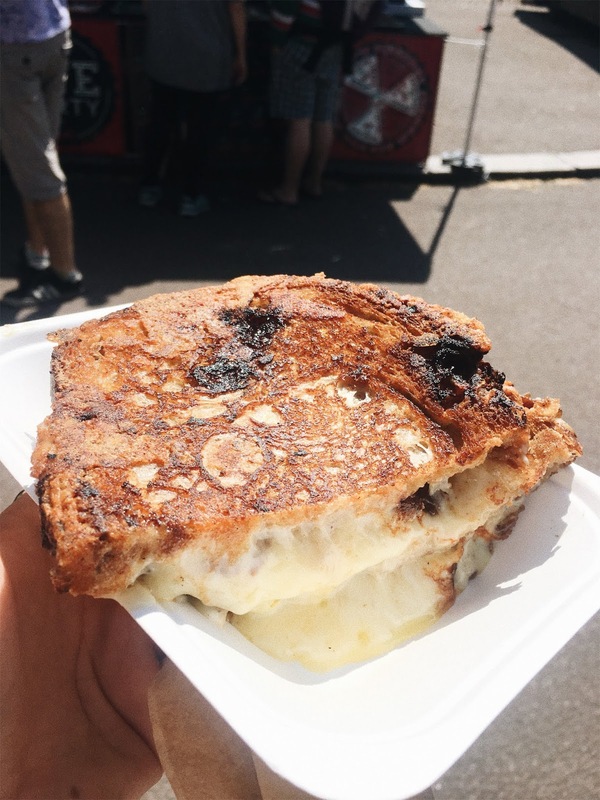 Okay, if you like cheese and live in London - you have to go to the food market in Victoria Park and try the grilled cheese from Meltsmiths - it is the best thing I have ever tried. It comes with onion jam, which at first I wasn’t too sure about, but oh my actual god it goes so well with the cheese and it is just so incredibly good. No words can explain how good it is, you just have to try it. I also had a cheesecake brownie which was fab, and I definitely want to go back and try the giant cookies and the red velvet cake. One word: pizza. They have the best pizza in London, in my opinion, in London. You do have to wait for a bit as there is usually a small queue but it is so worth it! They also have really good baklava, which is one of my favourite dessert, so I always have to have it when I am around there. I do think this market is very hyped up, but if you want good pizza or good baklava definitley worth a visit!